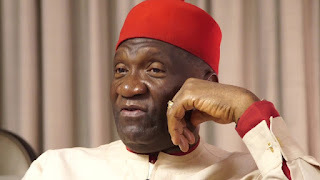 LAGOS, NIGERIA (VANGUARD) --President-General of apex Igbo Socio-cultural organisation, Ohanaeze Ndigbo, Chief John Nnia, has vowed to sabotage any attempt to levy war on Igboland in the name of agitation for Biafra. Chief Nwodo made the vow, yesterday, while addressing Ndigbo in Lagos at the practice pitch of the National Stadium. Recalling how he lost his best friend at the war front during the Nigeria-Biafra war, how more than two million Igbo lost their lives and how many dreams were aborted, Nwodo said as a leader he would not fold his arms and watch his people suffer such destruction again. Nwodo said he is not against the agitation for Biafra self determination and cries of the Indigenous People of Biafra, IPOB because the Igbo are truly marginalised and oppressed in Nigeria. However, he said is opposed to the methodology of the agitators because it cannot work in Nigeria as currently constituted. The only way out, he argued, is restructuring and enthronement of fiscal federalism which will allow the states to control their resources, handle issues like police, education, health, mineral resources, etc while the Federal Government handle functions like immigration, customs, central banking, aviation and external affairs. Nwodo declared his opposition to another war in Igboland when pro-Biafran youths wielding placards stormed the venue while he was addressing the crowd. Pleading with the security not to deal with the protesters, Nwodo said: “Nobody should touch these youths. They are my children. When I was their age, I was in the trench fighting for Biafra. My best friend died at the battle front. Noting that Southern leaders, southern governors and senators, and the Middle belt have agreed on the need to restructure Nigeria, he said the rejoinder of Northern senators to the Southern senators’ call on President Muhammadu Buhari to restructure the country was watery. “Northern senators issued a rejoinder to our position on restructuring, that we are heating the polity but they did not address the points we raised,” he said. On the leadership crisis in Lagos chapter of Ohanaeze, he said the recent election remains nullified because it was held in breach of the directives of Ohanaeze National Executive Committee, NEC. He urged all Igbo in Lagos to end their differences, unite and go a fresh elections, which he assured will be transparent, free and fair. He Lamented that disunity is the major reason Igbo are not getting their fair share in the affairs of the state in spite of being over four million in population and contributing about 40 per cent of taxes paid in Lagos. Notable Igbo leaders at the gathering include: Chief Guy Ikokwu, Agunze Chibueze Ikokwu, Chief Sylvan Ebigwei, Eze Hycinth Ohazulike, Chief Eric Ebe, Prince Emeka Ogbu and Chief Fabian Duru.